The Milwaukee Brewers are heading to the National League Championship Series (NLCS). 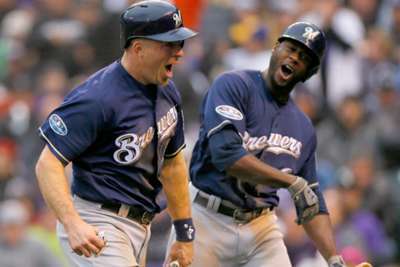 Milwaukee completed a three-game sweep of the Colorado Rockies with a 6-0 win at Coors Field on Sunday. They will now face the winners of the Los Angeles Dodgers-Atlanta Braves National League Division Series (NLDS) matchup with a spot in the World Series on the line. Colorado had an opportunity to at least tie the score 1-1 when Trevor Story led off the second with a single and moved into scoring position on a walk by Carlos Gonzalez two batters later. Ian Desmond, however, followed with a line out and Tony Wolters grounded out, ending the threat. Brewers starter Wade Miley shut down the Rockies but was removed after just 4.2 innings, leaving his bullpen to record 13 outs. Milwaukee's relievers were up to the challenge. Five Brewers pitchers held the Rockies scoreless in 4.1 innings of work. They allowed one hit, struck out six and walked just two. The Brewers relied on their bullpen heavily throughout the series and their relievers were a big reason for the sweep. They even went with a bullpen day in their game-one win. The Brewers have not lost since September 22. Milwaukee ended the regular-season by winning 10 of their last 11 games, including a game-163 victory over the Chicago Cubs to earn the National League Central title. They then opened the postseason by topping Colorado in three consecutive games. That is 11 straight wins for the Brewers, including the playoffs. They will head into the NLCS with a ton of momentum.